ISLAMABAD: The Supreme Court (SC) on Saturday allowed senators having dual nationalities to vote during the Senate chairmanship election. A five-member bench of the SC gave its decision in an interim order. It was also decided that a seven-member larger bench will be formed to deal with the suo motu case pertaining to senators holding dual nationality. The SC restored the membership of senators whose winning notification was not issued from the Election Commission of Pakistan (ECP) over the dual nationality issue. The senators whose notification had been withheld include Pakistan Tehreek-e-Insaf’s (PTI) Chaudhry Sarwar, Pakistan Muslim League-Nawaz’s Haroon Akhtar Khan, Sadia Abbasi and Nuzhat Sadiq, in light of the SC’s orders in dual nationality case. During the hearing, Justice Ijazul Ahsan asked what would happen to the Senate chairman’s election if the five senators-elect are disqualified in future. The CJP responded that due to the inherent complication of the matter, a seven-member bench will look into it. In compliance with the SC’s orders, the ECP conditionally notified the five senators whose notification were withheld a day before. The CJP had earlier asked the ECP to issue a provisional notification for the five newly-elected senators allegedly holding dual nationality. During the hearing, CJP Saqib Nisar said that Chaudhry Sarwar must give an undertaking that he would never restore his British nationality, otherwise he would face disqualification. Three newly-elected senators are from the ruling PML-N while one is affiliated with the Pakistan Tehreek-e-Insaf (PTI). Sarwar told the court that he renounced his British nationality in 2013, to which the CJP queried whether he gave up his British nationality for good, or temporarily. Sarwar’s counsel responded that British law allows for the nationalities to be restored. The CJP observed that it seemed as if Sarwar had temporarily renounced his British nationality in order to “become a governor after which he could restore his [British] nationality”. On Thursday, the SC ordered the four newly-elected senators to present their affidavits on Saturday stating that they had renounced their foreign nationalities before contesting the recent Senate elections. According to the order, Chaudhry Sarwar, Nuzhat Sadiq, Sadia Abbasi and Haroon Akhtar are required to submit authenticated and duly certified copies of documents to substantiate their respective claims. Earlier in the week, CJP Nisar, while hearing a suo motu case about civil servants in possession of dual nationality, had directed the ECP to withhold notifications of four senators-elect who allegedly possess dual nationalities. The CJP opined that if people in power of passing the country’s laws were dual nationals then they could easily “pass on classified information and escape to another country”. He clarified that he was not aware that elections for Senate chairman were to be held on March 12 when he passed the initial order to withhold notifications and that he did not intend to withhold notifications of ‘eligible voters’. Therefore, the case’s next hearing was fixed for March 10 in the SC’s Lahore Registry, so that senators-elect who are not dual nationals could be accommodated. Furthermore, the court during the hearing also appointed amici curiae (friends of the court) legal experts Khalid Khan and Bilal Manto to assist in the case. 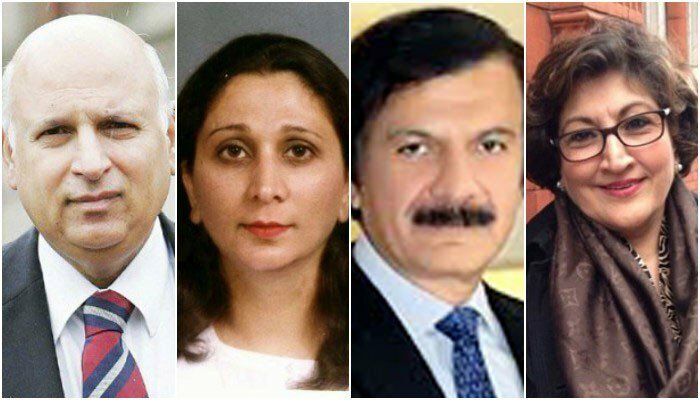 The attorney general (AG) had previously told the court that four senators-elect — Pakistan Tehreek-i-Insaf’s (PTI) Chaudhry Sarwar, Prime Minister Shahid Khaqan Abbasi’s sister Sadia Abbasi, and the PML-N’s Nuzhat Sadiq and Haroon Akhtar — possessed dual nationality. “PTI’s Sarwar is believed to be a UK national, while Nuzhat Sadiq and PM Abbasi’s sister Sadia hold a US nationality,” ECP Secretary Babar Yaqoob, who was representing the body, told the court. “Akhtar had previously denied holding a foreign nationality, but the interior ministry had confirmed that he was a Canadian citizen,” Yaqoob had said. The ECP secretary had said that though the senators holding dual nationality had submitted affidavits claiming that they had given up their nationality of other countries, they had not submitted any legal documents confirming the same. The SC subsequently ordered the ECP to withhold the notifications of the senators in question. The AG’s claim — that PTI senator-elect Sarwar possessed a dual nationality — had elicited a strong response from the party. The PTI’s media cell had released a statement along with a document from the UK Border Agency declaring that Sarwar had revoked his UK citizenship in 2013. Jail these corrupt people, they get the Government job and prove alliance to another nation’s passport. Sick people, very, very, sick and corrupt people. Make an example out of these people. Why in Pakistan people have to certify nationalism and certify their religion? Why courts distribute these certificates? I know many Pakistani dual nationals working abroad on high-level government positions. Why we as a nation stuck on these issues. Our priority should be poverty and health.